You've tracked the goblin down to the Goblin's Cave, and now he begs for mercy. Click here to play! He's been causing the local village trouble for quite some time now, but he says he'll repent if you, brave knight, will simply let him live. He isn't stupid, though - he knows you'll need to be rewarded for your efforts and the Goblin's Cave holds many treasures. From gold goblin coins to golden rings and shiny red gems, the Goblin's Cave slots offer fantastic rewards. Stock up on lanterns to venture further into the cave, and you may even find treasure chests brimming over with gold and other riches. In the Goblin's Cave slots, you spin three reels and may then hold as many of them or as few as you like. These are then held in two other sets of three reels as well, and you get paid out on any line that you have a winning combination on. The Goblin's Cave is yours to plunder, but you had best clear it out quickly before the goblin plays a trick on you. Red gems are wild and can substitute for other symbols. Multiple red gems can also make for more valuable payouts than lower valued symbols. Match three lanterns to play the bonus game. 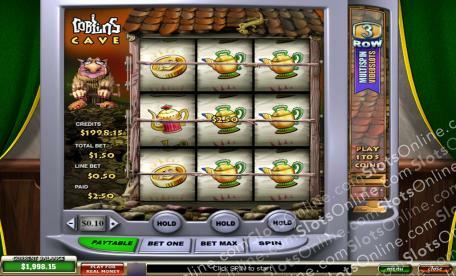 In it, you choose a treasure chest and get the corresponding bonus payout amount.